NUMIDIA, Penna. – Numidia’s policy to hire the best match races possible is certaintly paying off as one of the biggest crowds of the year were present to witness a best 2 out of 3 between Bill Jenkins and Gapp & Roush. It was impossible to contain the crowd as two cars came to the line for round 1. After the usual burnouts the cars staged and in 8.82 seconds it was all over. 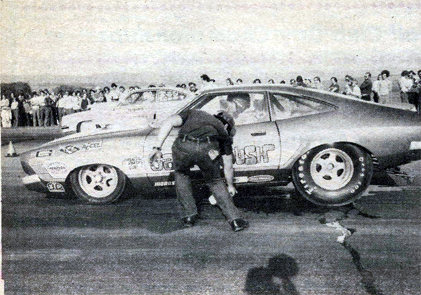 The Grump bumped Wayne Gapp in 8.82–153.58 mph to the Ford’s quicker 8.79–152. The second round Jenkins fouled and Gapp tore up the strip in pursuit, the little Ford ran its best time of the day setting a new Pro Stock record at 8.61 to Grump’s fouling 9.06–149.50. Everything hung on the third and final round and the first round reversed itself as Gapp ran a slower, but winning 8.88 to Jenkins 8.79. Once again Gapp won it all, the match race and a new MPH track record at 154.10. Wayne Gapp readies for his record setting run.